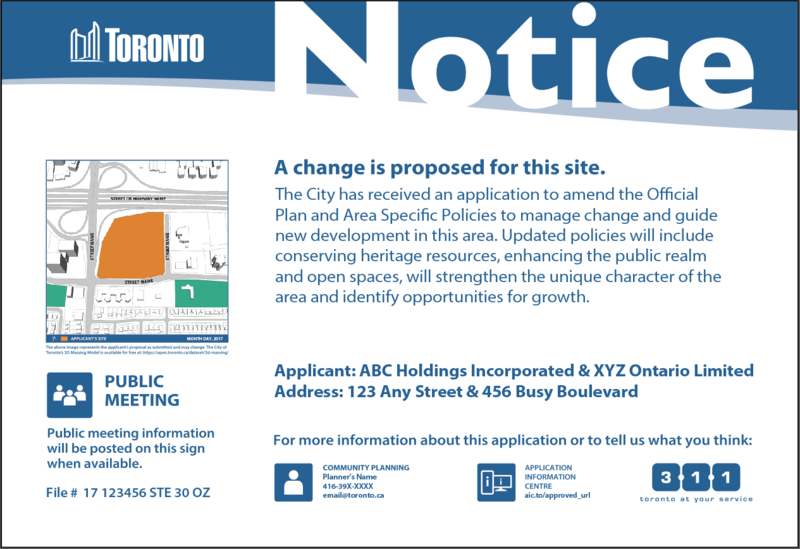 Applications for Official Plan Amendment, Zoning By-law Amendment, Draft Plan of Subdivision and Draft Plan of Condominium (Common Elements and Vacant Land only) require the posting of the sign to provide notice of the public meeting. 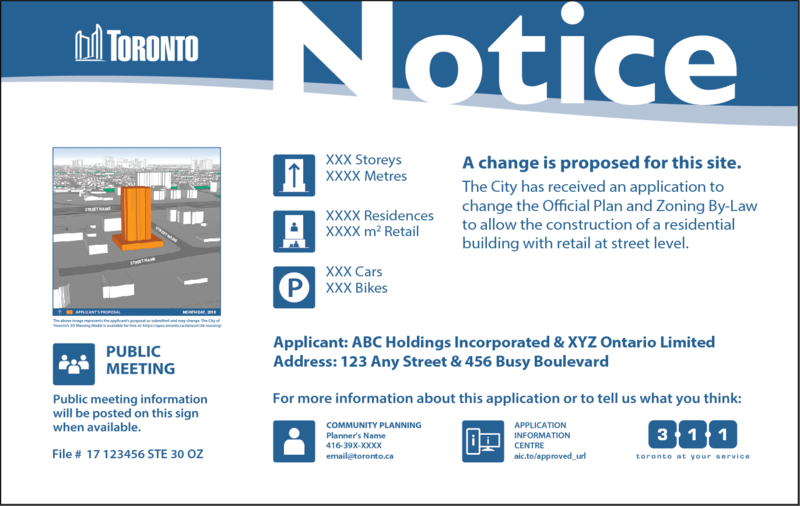 The applicant should discuss with the assigned planner what information needs to be included on the sign (proposal description, appropriate graphic, planner information and file number). We have recently updated our sign layout to make it easier to use, get approved and installed faster. We recognize that occasionally users would experience issues with their fonts. So we adjusted the design and now use the Adobe Illustrator default font Myriad Pro. We simplified the layer structure in the files and added some minor design changes. Please use these updated design files for your signs. 1) Here is the link to DevAppSign_Specsheet for creating the sign. 2) Here is the link to a guide for Sketchup_3D using SketchUp Pro and Photoshop. 3) Here is the link to Appendix1_Views which contains details with regards to establishing a Viewpoint of your model in Sketchup. 4) Here is the link to Appendix2_Maps which contains details with regards to creating 3D maps to be used when identifying a site. We provide two options for signage. 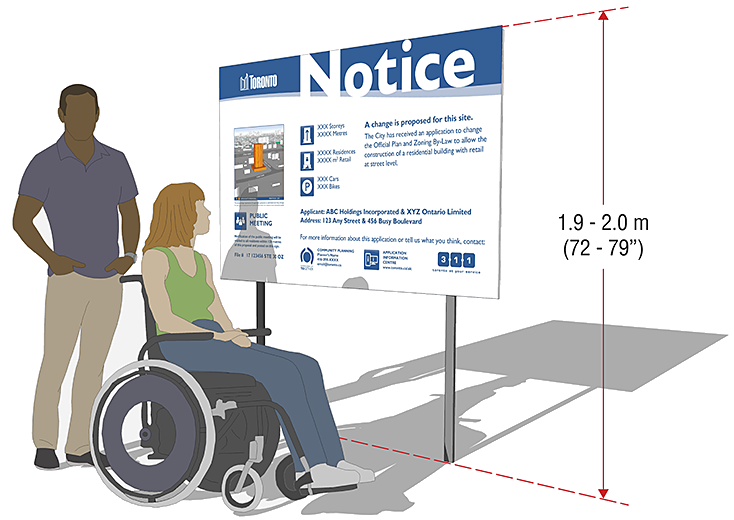 The standard sign, Option 1 contains icons and proposal details for increased accessibility and is the preferred design. Option 2 has a slightly smaller width, does not contain the icons and proposal details and is a text only version that may be used for special situations like policy changes. Option 1, with icons. The Adobe Illustrator working ZIP file DevAppSignOption1_May2018 can be downloaded for the required specifications to produce the sign. Option 2, without icons. The Adobe Illustrator working ZIP file DevAppSignOption2_May2018 can be downloaded for the required specifications to produce the sign. Additional icons for use with sign Option 1 can be found by downloading the Adobe Illustrator working ZIP file ExtraIcons_2018. The Adobe Illustrator working ZIP file PublicMeetingDecal_2018 can be downloaded for creating public meeting notice decals to be added to the sign after the public meeting dates have been arranged.